This large box introduced in 1979 was a well engineered example of a typical S-100 bus machine the CP/M era. It is built in a strong steel case with a high-current power supply feeding a 21-slot bus. However this is rather a waste as this particular machine only had 4 cards! As they were so well built a lot have survived to the present day so they are quite common. I was lucky in that I was given this machine together with an ADM-3A terminal and Anadex printer, I have subsequently sold the main unit and the terminal..
My System Two machine had four cards, all made by Cromemco and all in good condition. Cromemco ZPU containing a Z80 processor. Cromemco 64KZ memory card containing 64KB of RAM (bank switchable). Cromemco PRI providing two parallel ports. Cromemco 4FDC floppy disk controller. This also contains the RDOS boot EPROM, which has some basic monitor commands, and a serial port for a terminal. I was kindly sent a CDOS disk for this machine by a fellow collector in the UK. 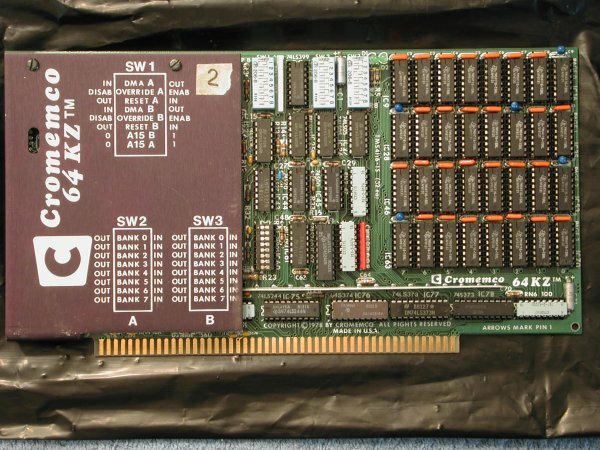 However I was not successful in finding a CP/M disk, the key requirement is that it runs on a 4FDC card (an image file is available for the 16FDC version).